This will be the first game of the season between two teams from the same BCS conference – of course the SEC. Mississippi State hasn’t had good success at home in this series. Auburn leads 11-4-1 in Starkville. And MSU hasn’t won an SEC opener since 1999. If you go by Week 1, this game could be a shootout between two of the most impressive first-year starting quarterbacks in the country. Last year, MSU was a ground-based team, averaging 227.6 yards per game, which ranked ninth in the nation and led the ACC. And MSU was good on the ground in an opening 49-7 home win over Memphis. But the story of that game was redshirt freshman quarterback Tyler Russell, one of second-year coach Dan Mullen’s recruiting jewels and one of the highest-rated prep QBs to ever sign at the school. Russell, who is actually the No. 2 quarterback, was 13-for-16 for 256 yards and a school record-tying four touchdowns in the win over Memphis. He currently leads the country in passer rating, just south of 300. Yet starter Chris Relf, who edged Russell in a camp competition, apparently will continue to start although obviously both will play. Relf offers a running option that Russell really doesn’t. Relf was 7-for-9 for 166 yards passing with a TD against Memphis and ran seven times for 20 yards. While Mississippi State leads the nation in passing efficiency after one week, Auburn is No. 2 thanks to Cameron Newton, a JuCo transfer and former top recruit stuck behind Tim Tebow at Florida (thus Newton left). Newton was named the SEC's Offensive Player of the Week after throwing for 186 yards and three touchdown passes while running for 171 and two other scores in a 52-26 win over Arkansas State. Of Newton's five scoring plays against Arkansas State, four were of 36 yards or more. The Tigers put up 608 total yards. Freshman running back Michael Dyer also looks like a star-to-be as the top 2010 recruit ran 14 times for 95 yards and one touchdown for Auburn. The Tigers rank fifth in the nation in rushing after one game. Auburn did allow 323 yards passing to ASU, so that might be a concern because the defense was a major issue at times in 2009. The Tigers are 2-point favorites with a total at 55.5 – with the game on ESPN, Bodog will have live betting available. This line has moved as much as 1.5 points at most books (the ones that have this at 1.5 right now) but generally from 2.5 to 2. Currently there is an approximately a 75 percent lean on Auburn. MSU was getting nearly 50 percent early in the week. Auburn is 6-2 ATS in the past eight meetings. The ‘under’ if 4-1 ATS in the past five meetings. Auburn is 1-8 ATS in its past nine road games. 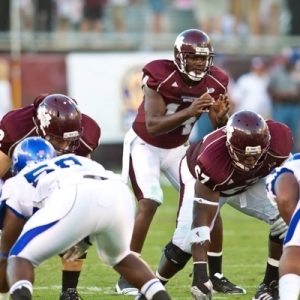 Mississippi State is 5-2 ATS in its past seven SEC games. Here’s all you need to know: Auburn is an incredible 16-1 in its past 17 SEC openers. In last year’s SEC opening win over Mississippi State, Auburn gained 589 yards and this offense looks way better already. The Tigers also are 4-0 all-time in Thursday SEC games. If the Tigers score 30 they don’t lose: They have won 57 in a row when doing so. Take Auburn in a big way and the ‘over’. Vegas Sports Informer has a college football handicapping goal of putting up +150 units for his NFL and college football picks for 2010-11. And the way he has performed in baseball and WNBA this summer, it could get a lot better than that. He had a very nice start to the college football season with a 5-1 performance in Week 1. Find out why this Vegas insider is terrifying the bookies in Sin City and across the globe. Click Here for more information on his picks.